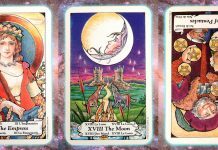 Pleiadian tarot interpreted through the lens of Nine: Having left behind you a path rife with aggressive energies, you’ve stayed true to yourself and out of the fray. Suddenly, everything looks new, and you’re on a different trajectory, moving forward with enthusiasm and the blessing of illumination. Ground yourself in this new sense of self, and stay open to new experiences from diverse directions. It’s a time for knowing secrets; keep your focus on the heart. 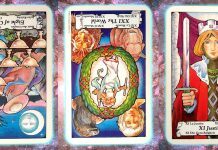 Read on for details about each of the cards in this week’s Pleiadian tarot spread. Summary: Last week, you took a last look at a legacy of having to stand your ground against aggression and outmoded ways of thinking. A period of introspection has now led to a whole new perspective, as if the world has been turned on its head. The result: Illumination of the shadows and a renewed passion for adventure. 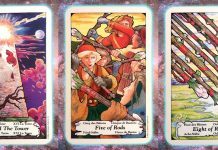 Moving forward, you can own your new sense of groundedness and control, to some extent, over your fate. World affairs notwithstanding, you are looking at reality with a firm sense of purpose now. Things are starting to make sense. 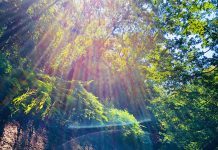 Be open in the days ahead to new and diverse pathways meeting with your experience. Whatever comes into your life now, meeting it with an open and balanced sense of self can open secrets of self-knowing. Just when you thought the sun was shining on your world, affairs have seemed to turn you around. Is that necessarily a bad thing? Hm, perhaps not, if you take into account the direction you’re now facing. For so long, you have been going over the same mental territory, stuck in a rut that might not have been of your own making — or maybe it has. Never mind all that. The source of light has flipped itself around to shine some sense on things from another angle. You’re much better off this way. Now you’re heading forward, ready and steady and on your way, with joy and the exuberance that a new adventure brings. Maybe it’s just a new way of doing things. Maybe it’s that you’ve taken a chance and changed your strategy. If this is what you’re seeing, rub your eyes all you want, but the fact is, reality has been turned on its head and never have things been more right with the world. Affairs of the heart, of working relationships, of creative endeavors all get a burst of new life, and the enthusiasm that comes pre-installed on a blank canvas. Now you can pull out all the tricks of your creative nature. The hard work of introspection and inspection of the shadows has yielded a new source of light where before had been obscurity. Onward now to victorious ventures! You’ve risen from your inward-focused time apart with the resolve and grounding long sought to face a brand new day dawning. You may feel humbled by the experience, especially seeing how world affairs can right themselves in the simple act of doing what’s right in the circumstances presented. You’ve stood firm in your self-knowing and the result is a sense of control and sober expectation. Steadily observing world affairs, you have a handle now on what before had seemed monumental. Balance and rest have done their magic, and brought you to the edge of the reality you have known. Now you stand facing something new. As the sun sets on the old set of world affairs and a new light begins to creep over the horizon, once-distant shores seem closer. Hoped-for change seems tenable now. You’ve earned a new feather in your cap, having stayed true to your principles despite the aggressions of a dying, desperate crowd of nay-sayers. You’ve held steady and spoken your truth. Words having been said, it’s time to maintain focus, and settle into this moment of relative peace. Breathe and feel your feet firm beneath you. Keep your aim on building strong and balanced, yet diverse, relations. Whether it’s between people, or interests, endeavors or information-gathering, strive to be balanced, open, and above all, heart-centered. The true blossoming of anything you choose to engage in comes from being rooted in a commonality of the heart and a concord of the mind. Seek balance, and move beyond polarity to include that which has hitherto been obscured, shunned, or misunderstood. That is the element that has the most to offer, when met on equal footing and a sense of community. Finding balance from which you can thrive need not be limited to those of like mind. Introduce yourself to new ways of approaching the world. Be open to the unexpected in finding amity, and honor the life such openness affords. Your best way forward now is in opening to that which may be alien to your thinking or your experience. 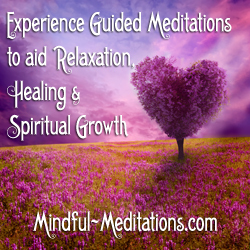 Met with the heart, you’ll be led to beneficial interactions and pleasant new experiences. It is a time of knowing secrets. 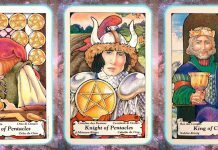 A note about the spread used in Nine’s Path Pleiadian Tarot: The cards represent the foundation, the lodestone (or inner knowing), and the most OMward direction (path to highest understanding and experience). 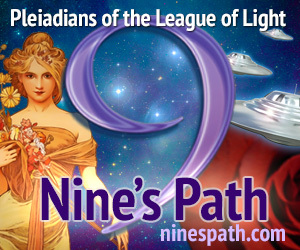 More insight on Pleiadian Tarot, the path of Nine, the League of Light’s Pleiadian teachings, and the work of contact Maryann Rada are at the Nine’s Path website. 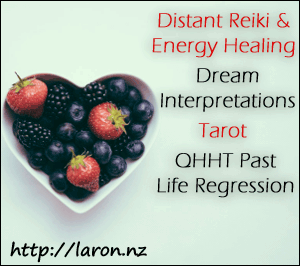 New insights for the world and for individuals are posted here on transients.info every week. Be sure to check back regularly to see the Pleiadians’ clues for the next step in our collective evolution. Please visit the Roundtable Forum and the Nine’s Path Facebook Group as well! 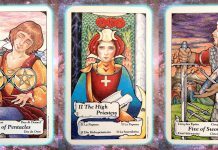 If you compare this week’s cards to last week’s, you can see the reversed Hierophant that was in the Lodestone position (reflecting the inner state) now is in the Foundation position, our jumping-off point for the coming days. A happy shift. Ready for the balance to settle in, which I finally feel is happening. 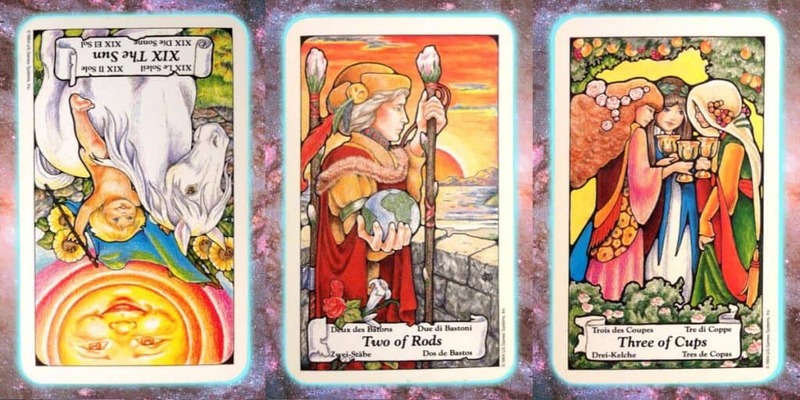 Isn’t the 2 of Rods in the Lodestone position this week? Yes that’s right, gosh that isn’t very clear is it? I’ve been dealign with GDPR too, obviously scrambled some circuits… I’ll clarify that. Thank you for pointing that out! And I just checked the previous 2 weeks. I saw the Heirophant reversed both times; first in the Foundation position, then, as you say, in the Lodestone position. Either way, yours are posts I always look forward to, Maryann. ‘GDPR scramble brain’ or not, there always seem to be some wonderful insights.